Bobbili Veena, also known as Saraswati Veena, is a musical instrument that once enjoyed the status of a royal music instrument. Kings of Bobbili were responsible for the invention of the Veena. There are numerous difference between Bobbili Veena and other veenas the most striking is the lion-head. 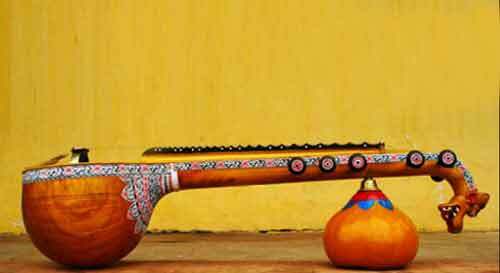 Bobbili Veena is made using jackfruit tree wood and a full size Bobbili Veena is known as Saraswati Veena. With the lion’s head carved at one end, the frets of Bobbili Veenas are made of bell metal. Bobbili veenas are made from jackfruit wood, and a full-size veena stands out from the ones made at Thanjavur, Mysore, Kerala or Nuzvid because of the lion's head carved at one end. The frets of Bobbili veenas are made of bell metal, while other veenas use brass. Earlier, the Bobbili veenas were known as “ekanda veena”, as they were made or carved out of one single piece of wood. But due to the paucity of good jackfruit wood, the veenas now have two joints. The other veenas have two or more joints. Bobbili veena is known for its quality of wood. Other veenas like the ones manufactured in Mysore are made of rosewood. The Andhra style of playing on Bobbili veena is considered attractive. The technique is different and the speed is more. The casing is much thinner compared to the others and the sound is shriller and more aristocratic. The treble is more in Bobbili veenas when compared to the others, where the bass is more. The Saraswati Veenas made in Bobbili are also sometimes referred to as Bobbili Veenas. Bobbili, a town 55 km from Vizianagaram, has a unique style of playing the Veena, developed over three centuries. It is known as the Bobbili veena sampradayam and its exponents have performed to much acclaim from Indian and International audiences. The history of making veenas dates back to the founder of Bobbili Kingdom, established in the 17th Century by Pedda Rayudu, when playing veena was leisure activity and had its importance in every social event. About 40 families belonging to the Sarvasiddhi family in Gollapalli village near Bobbili, are the sole manufacturers of this instrument apart from about a dozen families of the same clan setting shops across the country. They obtained GI status for the instrument in March 2012 and thus, protected it from extinction. Sarvasiddhi Achutha Narayanan, the descendent of Achanna who invented the Bobbili Veena, says that notwithstanding its fame for its unique treble, the instrument no more enjoys its former status. “The professional veena is vanishing, with not many people willing to learn it. Hence, we are now manufacturing the miniature versions which are gifted as mementos and memorabilia, to save the dying art,” he adds. Miniature - Today, there are more orders for miniature veenas than for the full-size ones. The craftsmen make them in four sizes — 9 inches, 13 inches, 18 inches and 24 inches long — and the veenas are marketed by the AP Handicrafts Development Corporation (Lepakshi).